A high over the North Island is moving away to the east while a low in the Tasman Sea is moving rapidly towards the South Island. Tomorrow the North Island will have light northerlies and the winds will be more from the northwest in the South Island. Sunday the winds will be increasing in strength and be northwesterly over both islands. The east coast of the South Island is forecast to have northerly winds. We had an unprecedented response to our last newsletter featuring Kevin. Many people wanted more information on how he fishes and how his rig works. Fortunately Kevin has been out kitefishing again and sent us more great pics. Kevin showing off his reel to his family. 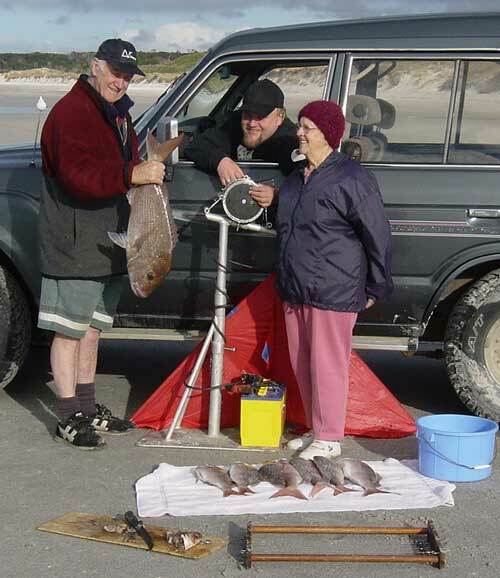 This is a great photo - all the gear, the fish, happy people and it is taken on the beach. A great close up of the fish of the day and Kevin's customised winch showing how he has attached the reel to the beach stand. On Wednesday, we went over to Rarawa beach and had a great time. We put the Big Dropper Rig out twice. Both sets had 15 hooks baited with mullet. We caught 13 snapper and the biggest weighed in at 5kg, a very nice fish. My dad and his sister Betty are here for a few days. Betty has never seen kitefishing before. She was so amazed when the line came in and and it was full of snapper. Paul's Fishing Kites have designed a new Kite Release Clip. The streamlined profile and lighter release settings available with the new Release Clip make it sensitive enough to be used in extremely light winds and allow it to be used in conjunction with our Pocket Sled Kites. This is an excellent improvement which will be of considerable benefit to Pocket Sled fishers wishing to cast other lines out. The adjustment range of new clip is also perfect for towing and releasing larger baits or more hooks when used in conjunction with our large Delta Kites and Flexiwing Kites. The advanced clip design has resulted in a clip that is simple to use, very light, and costs less than the heavier big game-fishing clips or specialist kite release clips. An added bonus is that there are no secondary bits you can loose. Well the weather has been against us again over the weekend. We have had more gale force southwest winds and a 4m southerly swell to contend with. Everyone turned to the river and the whitebait season, there were reports of some good catches on Friday. On Saturday one of our new bach owners, Rodger Gardiner, came down to our shop and purchased a Super Kite powered Dropper Rig. He couldn't wait to have a go at kitefishing so we both went straight down to the beach. The wind was not square off the beach so Rodger had to learn how to tack the Super Kite. It didn't take him long to master tacking the Kite and in no time he had a fishable angle. We baited up five hooks with baby squid and sent the Dropper Rig out. We retrieved it after half an hour and were pleased to have caught two kahawai off the five hooks. By this time the wind had picked up to near gale force so Rodger decided to call it a day. By Tuesday the wind had dropped completely away so Trev Sciascia decided to try out his new Mega Mouth Kite on his Bottom Longline. It worked perfectly and the gear went out in the almost imperceptible breeze. Trev used frozen squid bait and managed to catch a few lemon fish (rig) and kahawai, and thankfully no spiny dogs. We are all looking forward to spring down our way and kitefishing in less than gale force winds. It has been a long winter. There are some good size gurnard in the harbour. My partner Mark and I have been putting out the Boat Longline and catching some great fish up to 1.5kgs. We haven't checked the scallops for a few weeks but they should be fattening up and ready to eat very soon. The kahawai are very big and hungry as well. There are lots of kahawai over 10lb which is great news for the upcoming kahawai contest being held on the Manukau at the end of the month. The trevally have not shown up in the upper harbour yet but we should be catching them in the next few weeks. Enough time for us to clean out the smokehouse. 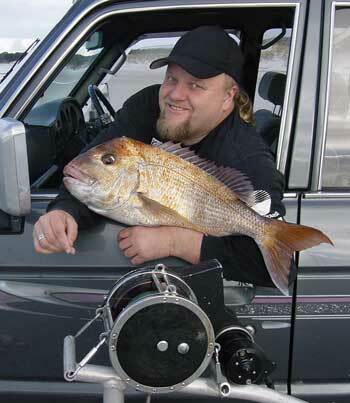 Aaron from Coromandel Fish and Dive reports the snapper fishing is going well, particularly around the islands. A 12lb snapper was caught last weekend by one of the locals fishing from a boat. The best time to be out fishing is a few hours before high tide. This weekend looks like a good time to get out there and catch a few. Further down the east coast kitefishers are catching gurnard off the beach at Bowentown. Bill from Churstains Sportsworld in Morrinsville reports the successful fishers are using bonito for bait. Whitianga is producing alot of small snapper but fish up to 4kg have been taken over the past few weeks. Darren from Mokau Roadhouse says the days kitefishers have been able to get out they have been catching a few pan-sized snapper. There are lots of spiny dogs and sharks being caught as well, which is normal for this time of year. For those able to get off the coast there are plenty of crayfish on the reefs. I was surprised to find we had Te Arai to ourselves last Saturday afternoon. Noone else on the beach and a city of over a million a little more than an hour away - you've got to love this country. The conditions seemed perfect. No significant swell, moderate offshore wind and great looking water with an incoming tide. We fished from 3pm through till about 8pm using a Flexiwing Rig. However, after three sets out wide of the point we only had one gurnard to show for ourselves. One of those days when it was all about just being there! Still, I think I'll try somewhere else this weekend. I eventually finished the gardening at 3pm last Sunday. What a coincidence, the wind had finally turned offshore! By 4pm I was sending out the first of three sets with my Pocket Sled. The weather was perfect, as was the sea. The only problem was a pod of seven to ten dolphins working 100 - 200 metres offshore. As I have nothing else to blame, I'll have to blame them for not catching a thing (except a gannet that flew into the dropper line). Kitefishers south of Auckland will be pleased to know you have another local stockist of Paul's Fishing Kites products handy to Kariotahi Beach. Home and Harmony are now stocking a comprehensive range of Paul's Fishing Kites Ready to Fish Rigs, Kites, Boat Longlines, Target Snapper Hooks and spare parts. Drop in and see the team at Home and Harmony. They look forward to helping you with all of your kitefishing requirements. You can find Home and Harmony opposite the ASB in Waiuku. The Beach Reports have been coming in regularly. Thank you to all those who have contributed to the database so far.